My daughter has been doing some cute things lately — so I am writing them down before nap time ends and I forget. Cute thing #1: Yoga, or more specifically downward dog, as can be seen in this slightly out of focus iPhone photo. 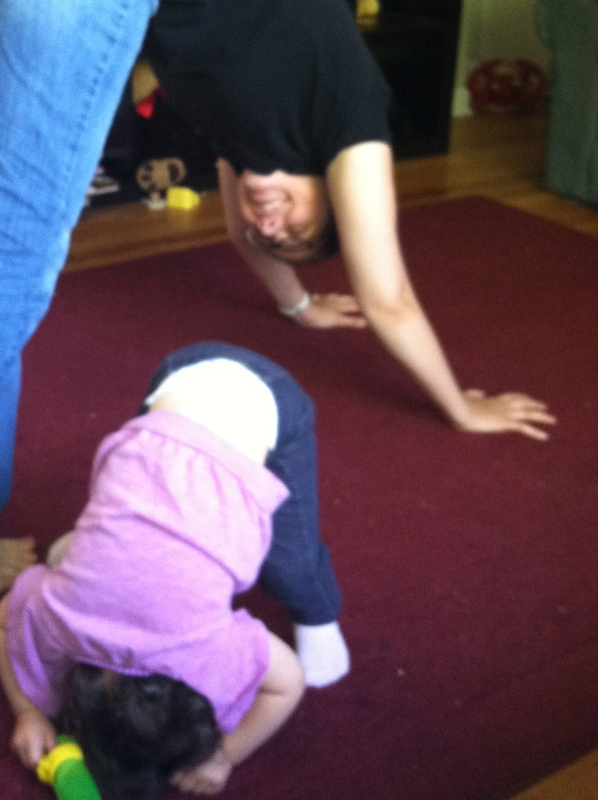 Maybe she does this because I took her to mom and baby yoga with me from age 5 to 8 months. Or maybe she just likes looking at the world upside down. Who knows? She also says “Om” and “Amen.” I’ve learned from yoga that sometimes it just feels good to say “Om” when you’re having a hard day. Hard days are common when you’re parenting a young child and you don’t have a dishwasher or a washer/dryer. So I say “Om” a lot. Cute thing #2: Yesterday morning when she woke up she kept softly touching my face and saying “Gentle, gentle.” This is what I tell her when she touches other babies. Then she smacked me. I think she was making a joke. Toddler humor. Cute thing #3: Last night my husband was cuddling with his arm around her. He thought she was asleep and he took his arm away. She said, “No!” and then she grabbed his arm. She loves her cuddle times. Cute thing #4: Kissing babies. She is obsessed with babies — whenever we see one she yells, “baby!” Often she will go up to them and kiss them. She also likes to kiss her own reflection in the mirror. Narcissist. Cute thing #5: Singing. She will sing “brella, brella” (umbrella) over and over. This is her reinterpretation of the song “Under my umbrella,” which we sing in baby sign class and library story time. She also now sings “Hello, happy” which is her rendition of another song from baby sign class. Additionally, she enjoys playing the piano, so perhaps I have a future musician.